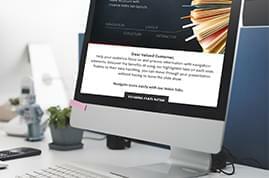 Implement agile methods into your daily tasks with our PowerPoint templates for Agile Project Management, Scrum and Agile Marketing all in one bundle. 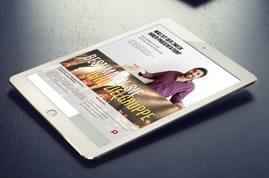 Agile marketing or management is characterized by a high degree of flexibility. The project is thereby divided into many small sub-steps, each of which presents a specific intermediate result at the end. This procedure even makes it possible to make adjustments during an ongoing project and can thus respond to most changing circumstances. In the field of agile marketing, many small and rapidly successive marketing activities of a large advertising campaign are the focus. Especially in the fast-growing field of online media, you can react to current trends quickly and purposefully by using this method. 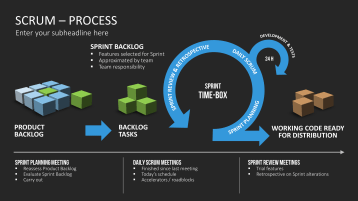 The agile project management, specifically the Scrum method, pursues a similar portable design. The interaction with the customer is emphasized, and the preliminary version of the product is regularly discussed with the customer to set the pace of further development. True to the KISS principle ("Keep it simple and smart,") the attention is focused on the solid performance of the product. 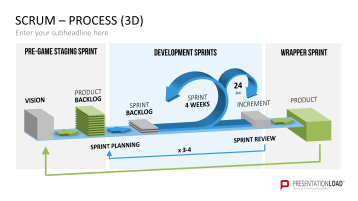 The flexibility of agile approach, the exchange between companies and customers and the autonomous work of the team make your workflow more efficient, motivate your employees and ultimately ensure customer satisfaction. This bundle summarizes three of our products for agile management, providing a full set of guidelines and working documents for implementing these methods into your project as well as product management and marketing. The Scrum toolbox contains 60 PowerPoint slides with valuable tools for working with the Scrum framework. 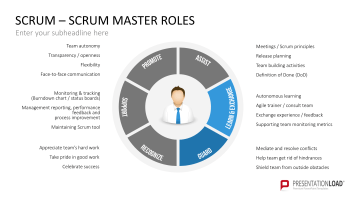 As the Scrum Master, present the product owner processes and rules, or give the status on the progress of your work to a member of the Scrum team. 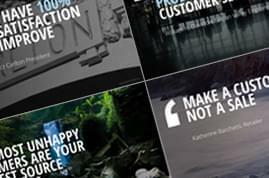 This template set includes an extensive collection of work tools for you and your team. Graphs, charts, and other combined slides help implement flexible project management into your company. 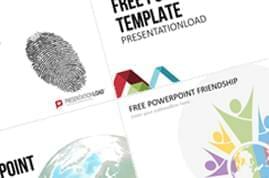 These PowerPoint templates support you in developing and implementing new and contemporary concepts for your marketing campaigns. 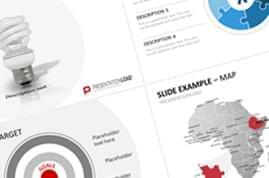 The guidelines and definitions included in the template set offer a concise overview of the main approaches and methods of agile marketing. Great to have found you! 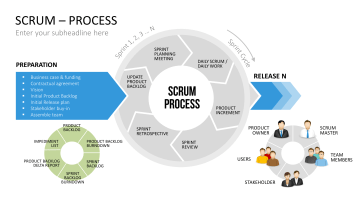 These SCRUM templates and explanations are really the best out there. Not only are the nicely designed and comprehensible, but they are in no time ready to be used for your own data entry and analysis, great product. These are functional, look fantastic and do the job well at explaining SCRUM. It’s just what I needed. I’m already curious to see what your next products will be, you got me hooked. Keep up the great work!